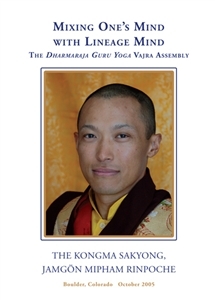 Available to students who have attended Sacred World Assembly or Vajrayana Seminary. Please include the year you attended in the comments section of your order. 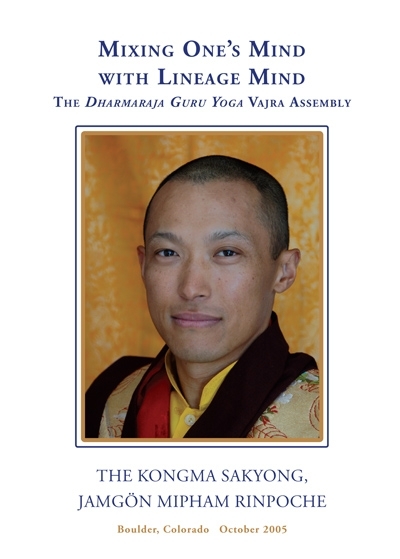 In October 2005, the Kongma Sakyong, Jamgön Mipham Rinpoche, taught a Vajra Assembly in Boulder, Colorado, on the Dharmaraja Guru Yoga. He had composed this practice earlier that year, while he was completing the Scorpion Seal retreat at Kalapa Valley. In this series of three talks, Rinpoche teaches on the guru principle and the unfolding of the Shambhala lineage, referring in a very intimate way to the many aspects of his father's inheritance. He gives instructions on how to approach a guru yoga practice. As well, he offers a commentary on each part of the Dharmaraja Guru Yoga, including some guided practice.